Of all the questions I’ve received from readers, this might just be one of the most popular ones… which tells me something about you guys – ya’ll are just as nosy as I am! And I love it! Before I get this tour going , two things – 1) My crafting room never looks like this. I do my best to keep it tidy, but there are always a few projects strewn about. I kind of prefer it that way…a little bit of mess makes me feel productive and creative. 2) I’ve seen some pretty amazing crafting spaces. Like something straight off of HGTV. That is not my space. I’ve pieced together this room with old and new furniture and it suits my needs perfectly! It will not, however, be in the pages of House Beautiful anytime soon. I’m cool with that. My craft room also serves are our guest room…which is pretty funny, since every guest we’ve ever had in this room has actually created something with my crafting supplies – so fun! The main wall of my craft room measures about 10 feet across and houses my desk and the bulk of my storage space. My crafting desk, drawers and chairs are all from IKEA – the only place to purchase craft room furniture in my opinion! The two tall towers that flank my desk are also from IKEA and are part of their BESTA collection. The shelving above my desk is from the Container Store’s Elfa System, which is absolutely the best for customizing small spaces. I must have spent 3 hours working with the people at the Container Store sketching and planning out these shelves! In the end, I have the perfect space for storing all of my goodies. The shelves on the right are where I store all of my stamps in mesh CD case organizers. I wish I could tell you that I have some amazing organizational system for keeping my stamps in order…but I don’t. One day. When I have an assistant! And see that file drawer on wheels under my desk, on the right? That’s where I keep all of my cardstock, acrylic stamping blocks, paper trimmer & scoring board. For more deets on the cart and more photos of the room, just click through …. I keep my cardstock organized in coordinating hanging file folders, which is mostly for function, but it also looks pretty! It’s really nice to have my “most used” supplies at an arm’s length away! Of all the organization tools in my craft room, this file cart is by far my favorite! 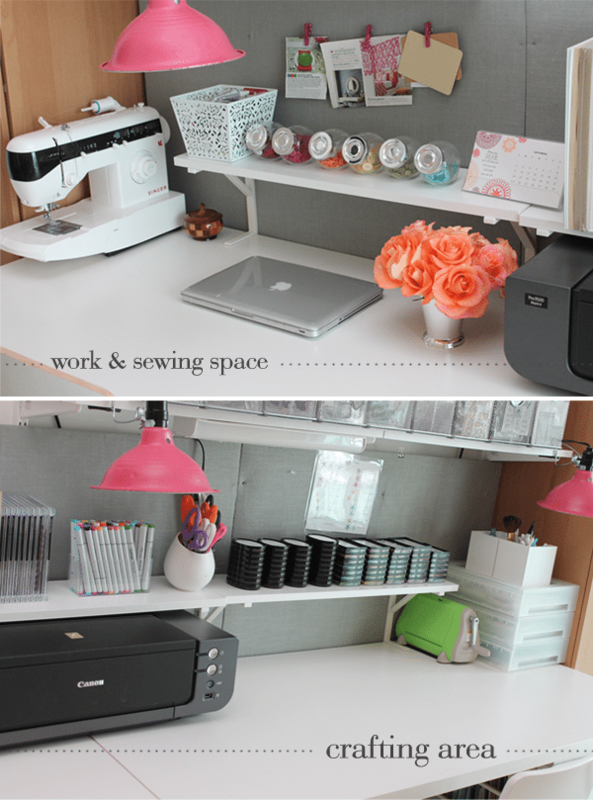 When it’s time for me to sit down and get crafty, I divide my craft desk into two spaces…. My work & sewing area is set up so that I can easily access my everyday printer as well as my sewing supplies. The other side of my desk is where I do all of my crafting. It’s a bit closer to the window, which gives me great light and I also have access to all my ink pads, markers, scissors and other basics. Above the couch, I installed a floating shelf where I show off all of my favorite cards and my Paper Crafts Magazine covers! 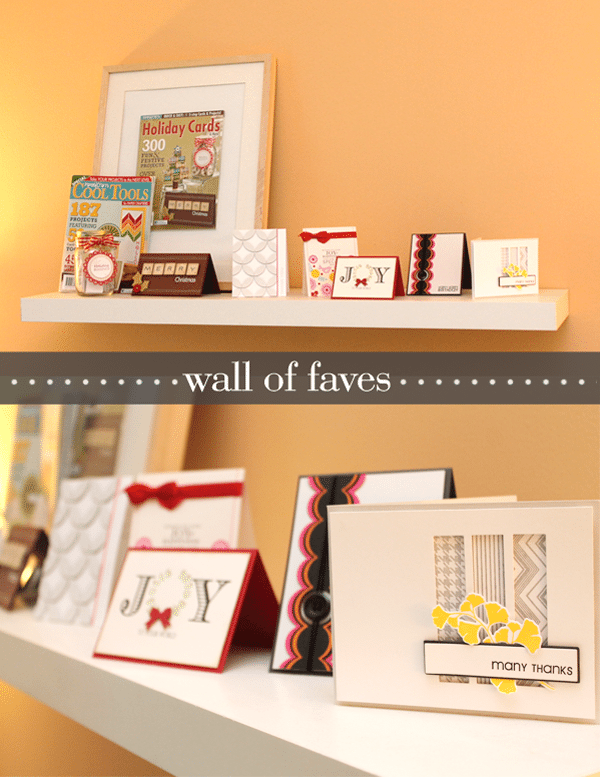 Even if you have just a few inches of spare space, I really suggest using it to show off your favorite designs. For me it’s really inspiring to see them up there on display! Makes me feel like I’m a legitimate crafty girl. Around the room, I have several little organizational “stations” that keep things in order. For only $24.99, my white bookshelf from IKEA is a lifesaver! It has a very small footprint but can hold tons. I use it to keep back issues of Paper Crafts Magazine as well as my ever growing stash of envelopes! You may recognize that pillow on top from THIS post! When it comes to ribbon, I own entirely too much for someone who rarely uses it…but isn’t that always the way with us crazy hoarding crafters?! I picked up those ribbon organizers from the Container Store along with those slanted jars (which I got on clearance after Christmas) and I use them to corral all of my ribbon scraps. 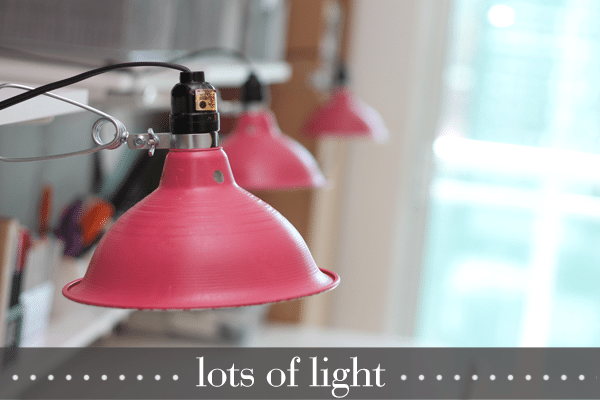 One of the MOST necessary components of my craftroom layout is lots of light. Since most of my creating is done in the wee hours of the night, I can’t take advantage of Mr. Sun, who come beaming in from the large window…so instead I have to create my own. To give me strong, bright, white light, I use clamp work lights which I fit with Ecosmart 14 watt (60 watt equivalent) daylight bulbs. Now, just believe me when I tell you that these bulbs will light your workspace up like Christmas at the Griswold’s and they last FOREVER. I kid you not. I have had the same light bulbs in these lamps since Damask Love started in January 2011. How’s that for a “shining” endorsement! I got the idea to spray paint the lamps from this post over at Little Green Notebook – and I’m so glad I did. Makes it so purdy! And that’s it! So glad I got to share this with you. OH – one more thing – see that pink notebook sitting next to my laptop – that’s another calendar coming up next week! You won’t wanna miss it! I’m happy to answer all your questions about this post! I ask though, that you leave them in the comments section and I’ll reply to each and every one! This way, everyone can see what’s being asked and get as much information as possible! What a lovely and well organised Craft room, thank you for sharing your ideas with us! I’ve got the wide Ikea Alex drawers – love them! What a lovely and organized craft room. I do like the filing cart. Wish I had a craft room. Thanks for sharing. Love your room, Amber! So jealous of all the light (at least in the daytime!)! I love your craft room Amber! I would feel inspired to create if I had a space like yours, thanks for some ideas that I can implement in my space. I love IKEA! Watch out…House Beautiful is going to come a knockin’! What a great space! Ikea is coming to Kansas soon, so I see a nifty little craft area in my future! Love your place! It looks like the cards you do: Clear and simple, and extremely beautiful 🙂 Enjoy! What a beautiful craft room. Thanks for sharing. Well this is very tidy and lovely. It is not unlike my office, which has my computer desk and craft table on one side, and a futon sofa to make it a spare room on the other. I like the idea of the “wall of faves.” I think I will try that too. 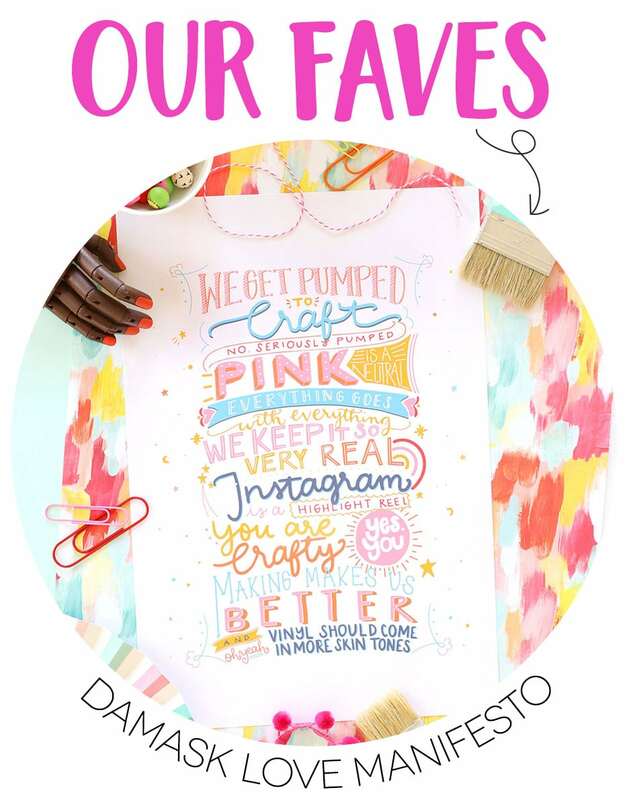 LOVE, LOVE, LOVE your craft space! You are such an inspiration! Oh I want a room for my crafting! 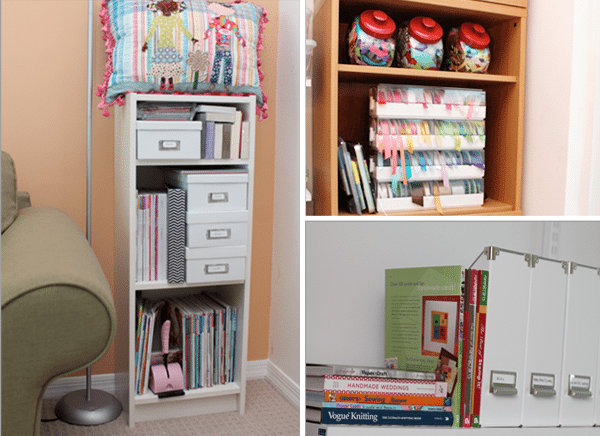 Hoping after I finish my studying, I can start investing in some shelves and revamp my craft room! Oh two chairs…. One for you and one for me! Lovely room! Love your crafting room. So organized. Oh if you saw mine, you’d certainly reconsider the likelihood of yours making house and home! Such a pretty space Amber! 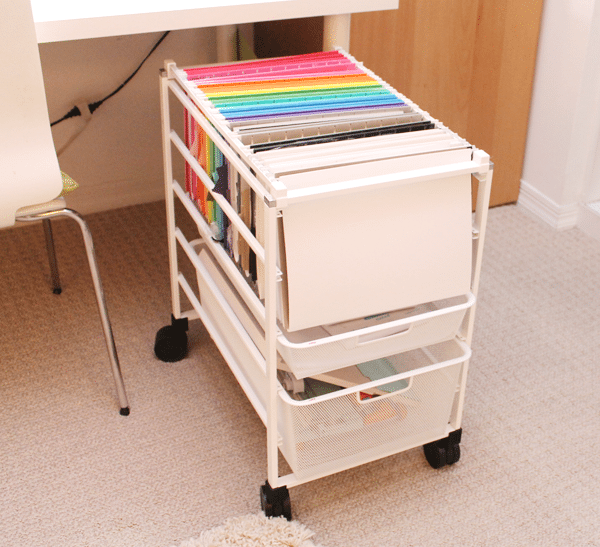 Love your file cart! Did you get the legal size one or the regular size one? And where did you find the hanging file folders in those pretty rainbow colors? I would absolutely LOVE that! 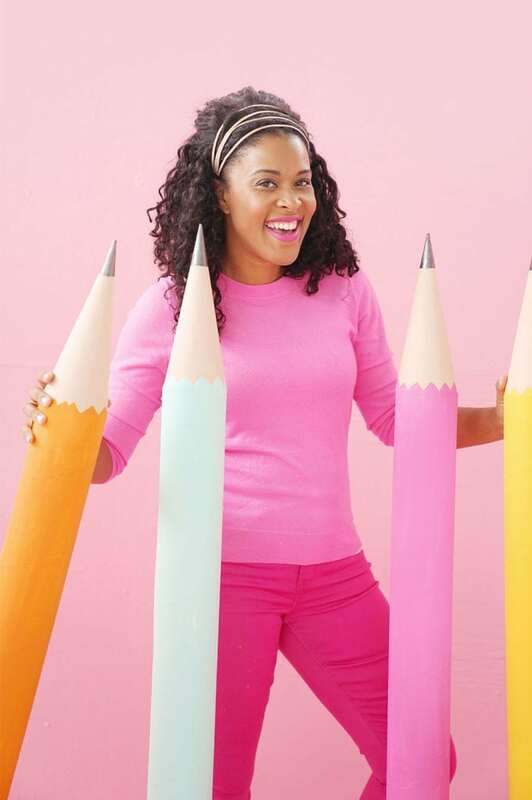 Thanks for being such a bright spot of inspiration to so many of us! 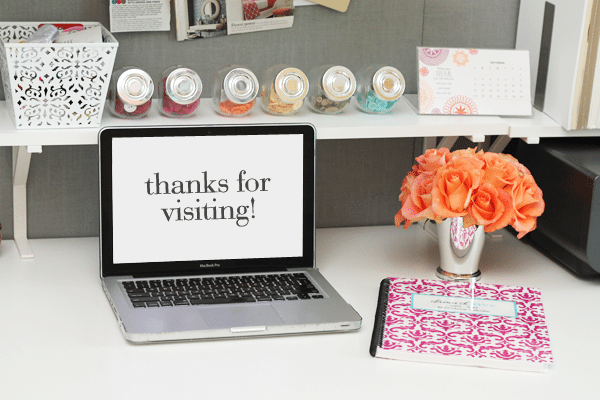 Thank you for sharing your well designed space! I am in the midst of trying to figure out a good layout for my craft room/ office. Do you have any ideas on how to or where to go to help with the layout of the room? I.e. have mis matched pieces of furniture and am trying to figure out what to put where. I already have most of the storage taken care of since I took over my kids bonus room storage. :). I’ve been stuck for months, and am going through creativity withdrawals. Lol. Thanks for any suggestions! I love your clean looking workspace! Thanks for sharing all those links, that’s very helpful!! I’m going to share this on Pinterest for future reference! 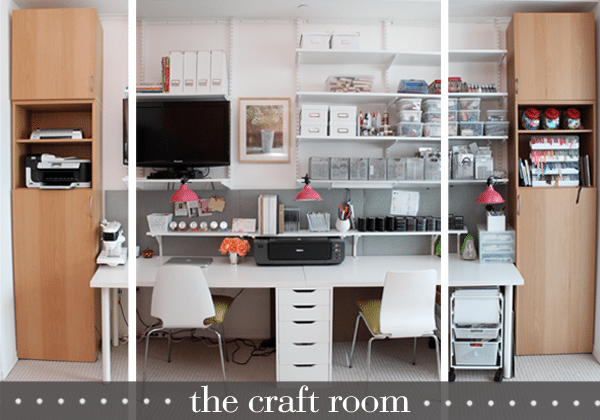 This is the best organized craftroom I have seen so far that would REALLY work for my needs. Thank you so much for all the detail. I am very excited to finish arranging my room with some of your ideas. Beautiful and functional. No IKEA in central NY – yet. Keep hoping. My 12 x 12 room is ALL craft stuff – way too much of it. I need to hoe out the “someday I make want to make something with this” stuff and get better organized. 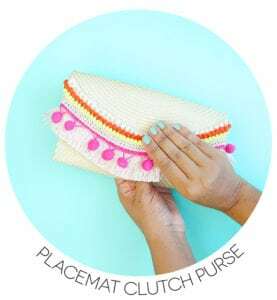 Have Stamp N Storage for my punches (LOVE all his storage items – sturdy and functional! ), ink pan/refill/pen storage unit, another ink pad storage, and another punch storage, Very compact and planned to all go together size-wise. Now to find my desk so I CAN work, and figure out where I’ve put everything! At 77 think I may be too old to get it all together, but keep trying. You’re an inspiration, and your photo cracks me up every time I see it. I am so impressed with your space. Well organised. You have just shown me that one could make use of whatever space you have for crafting. Pls can you share with us how you take those good quality pictures. You’ll see the related posts at the end of this first one. I wish my mess of a craft space looked like this! I must ask since I too craft into the wee hours. Do you have to wait to take your pictures until daylight, do your pink lights do the job, or do you have another method? 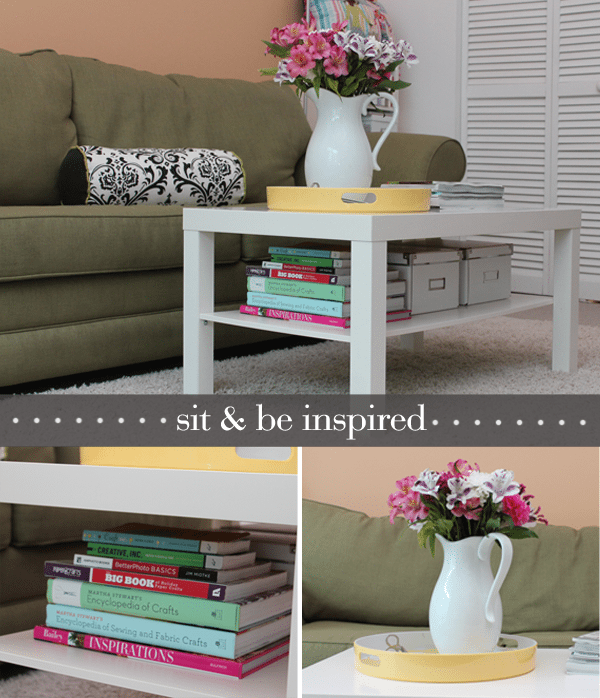 I especially love that you have an area to sit and be inspired. Thanks for sharing. Wow. Love it. I fantasise about having a space like this! When’s my turn?? lol. I wondered, where do you hide the cabling for your electrical machines (printer, laptop, sewing machine, etc)? How do you organise the cabling, including the lights’ cables. Goodafternoon,this first time ivisit your page ilove it,iwant ask you if you have account in insagram,also iam working on hand crafts and gift,and if you have ashop ihope to visited inmy next trip to Paris. I love your blog, I just found it and subscribed to it. I see that you made a calendar with pink damask notebook, do you have the link to that, it looks like I am looking at older information. 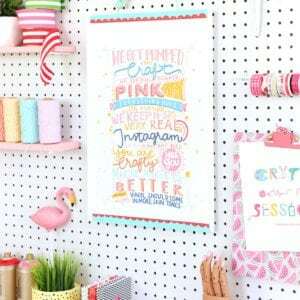 Planning a craft room that has many similar features. Kudos to you for great use of your space. May I impose on you to share more info on your tall towers in the BESTA line from IKEA. Having difficulty finding them on line. Thanks in advance for doing that.